If you live and Michigan and need your driver’s license back, you’ll have to go through an appeal hearing conducted by a hearing officer with the Administrative Hearing Section (AHS) of the Michigan Secretary of State. If you don’t live here, but have a Michigan “hold” on your driving record that you need removed, you should (if you want to win) come back to Michigan for a license appeal hearing. While the hearing is important, if the case has been properly handled from the start, it is not, contrary to some beliefs, some dramatic, “It all comes down to this” moment. Instead, the hearing should be seen and used as an opportunity to confirm and reinforce the evidence that makes up your case, and provide the hearing officer with an opportunity to clarify a few things through questioning. What do you mean by “questioning?” What will I be asked? How should I answer? Questions, it seems, bring even more questions. 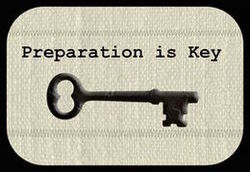 Preparing for your license hearing involves, in large part, being ready for the questions you’ll be asked. Yet for all the experience and skill and strategy that goes into this, the real key to winning is telling the truth, and that means that you must have honestly quit drinking and be genuinely sober as a starting point in any license reinstatement case. I have written enough about that topic, so in this article, we’ll just start with the assumption that you are, in fact, genuinely sober. About the first and biggest mistake someone can make is to place too much emphasis on the hearing. There is a tendency to think that the hearing is some kind of “It all comes down to this!” moment. The hearing is not, however, some dramatic proceeding. If your case has been properly handled up to this point, getting your license back does not “hang in the balance.” To put things in perspective, the hearing is really an opportunity to confirm the information you have provided in your substance abuse evaluation, letters of support and other evidence that has been submitted. In a sense, there is no way to really separate out any one part of the license restoration process from all the others, because they all work together. Thus, while the hearing is important, if you haven’t already done everything necessary to win your case before the hearing, it’s too late. There is nothing you can do at the hearing to save it if you didn’t already submit a case that’s a winner on paper. This is why, for example, I spend 3 hours with a new client at our first meeting. The primary purpose of that meeting is to prepare my client to undergo his or her substance abuse evaluation because it is so important (I often call it the “foundation” of a license restoration case) and because any errors, inaccuracies or omissions can easily result in the denial of a case. Before I correct and approve the letters of support in a license appeal case, I need to make sure that the information they convey is consistent with what’s disclosed in the substance abuse evaluation, and before I approve the substance abuse evaluation, I double check it, relying in large part, upon my own form called a “substance abuse evaluation checklist,” that I also provide to the evaluator, to make sure the evaluation turns out both accurate and favorable. This means that the letters of support and the substance abuse evaluation must not only be consistent and work together, they must do that in a way that makes the hearing a kind of extension of them. To put it another way, the hearing itself is very specifically about the evidence presented in your substance abuse evaluation, letters of support, and other evidence filed in a case. All of the evidence in a case all comes together to tell a story, and that unique story becomes the theme of each and every case. It is this theme that is the core of hearing preparation. This goes back to something I noted early on: Your case must be all about the truth. If you’ve honestly gone through the process of getting sober, then you understand that it involves profound life changes. Getting sober involves a lot more than just “quitting drinking.” To stay quit, you have to change all kinds of things, including the way you think, the way you handle stress, loss, joy, and social situations, who you hang around and where you hang out. Just about anyone with even 2 years of sobriety under his or her belt would agree that life today looks extraordinarily different than it did before that last drink. This should be clearly reflected in your evidence; if not, then you’ve probably already lost your case. For my part, the default plan is to call the client for “prep” the evening before the hearing. Sometimes, I may try to call the person a day or 2 before, especially on weekends, but our fallback is always that if we don’t connect before that, I’ll call the evening before. It’s hard for me to set a time when I’ll call, especially if I get home late and have more than 1 “prep” to do, so I simply tell the client that I will call, and if I don’t get you, I’ll call back, and if I miss you then, I’ll call back again, and keep doing that until we do connect. My “prep sessions” take between ½ hour to an hour, although in some cases, I may spend even more time with the client getting ready. The point here is not to measure the time necessary to properly prepare, but rather to take the time necessary to properly prepare. Since I provide a “win guarantee” in every case I take, you can bet that I do everything necessary to make sure my client is ready to go. The last thing I want to do is clip off a few minutes of prep time and overlook something, thus obligating myself to reinvest all the time required to do the case all over again next year for free. One of the big issues in preparing for a license appeal hearing is to make sure we prepare for the specific hearing officer who will be deciding the case. I make sure that all of my cases are heard live at the Livonia location of the AHS. There are 5 hearing officers there, and each one conducts his or her hearings differently than the others. Some hearing officers have a full set of unique questions they’ll ask, while others prefer that the lawyer ask most of the questions. What this means is that the preparation in any given case will be different, depending on the particular hearing officer to which it is assigned. This also means that if you have not been prepared for the specific hearing officer who will be deciding your case, you have not been “properly” prepared for your hearing. Sure, there are certain core issues important to every hearing officer, and certain core questions that each will ask, or expect me to ask, but it is only through repeated experience that one learns the nuances of what each hearing officer finds particularly important in a license appeal case, and how each deals with things like the use of certain prescription medications or attendance, or lack of attendance, at support groups such as AA. It is not trite to observe here that every case is, indeed, unique, and needs to be treated as such; in fact, it’s imperative to recognize it. As we’ve seen, you need to be prepared – properly and thoroughly prepared – for your license appeal hearing. The hearing itself is really an opportunity for the hearing officer to confirm the information that was provided, or at least should have been provided, in the evidence submitted to get the license restoration process underway. Whatever else, a person should always walk into the hearing office knowing exactly what to expect and what is going to take place. If you need to win your license back, whether you live in Michigan or just have a Michigan “hold” on your driving record, and you’ve honestly quit drinking, then I can do that for you, and I guarantee it. To find out more, contact my office anytime Monday through Friday, from 8:30 a.m. to 5:00 p.m. (eastern standard time) at 586-465-1980. We’re standing by to help.